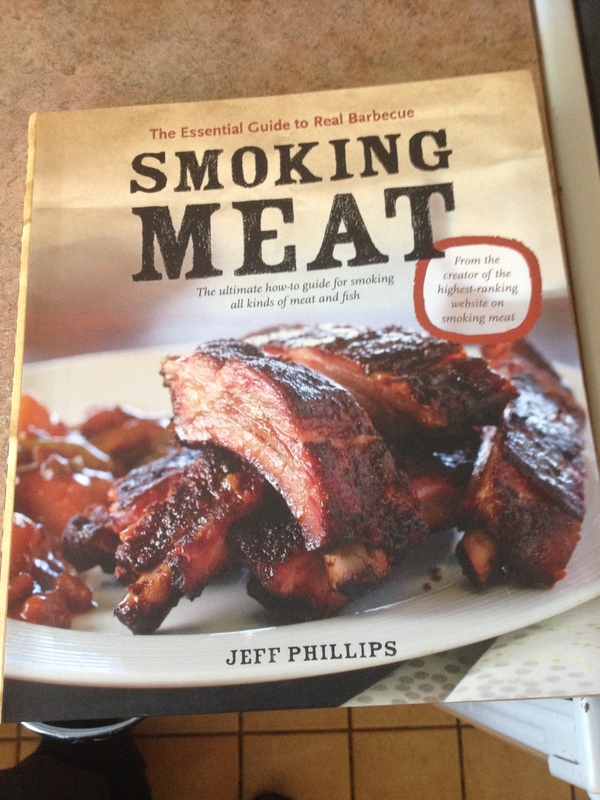 Santy Claus brought me a new BBQ cookbook and I need to show up at a neighbor dinner with appetizers. How about some smoked chicken wings? Easy yum yums. I rigged my UDS for smoking at 200 with about 2/3 a coal chimney’s worth of charcoal. Atop that hot mess I added a mix of hickory chunks and cherry chips with the intent to leave it alone for about 1 & 1/2 to 2 hours. I figured that kiddos might prefer the drumettes while the adults can negotiate the entire three part wing. I let the whole batch smoke for about 1 hour 45 minutes, all 5+ lbs. 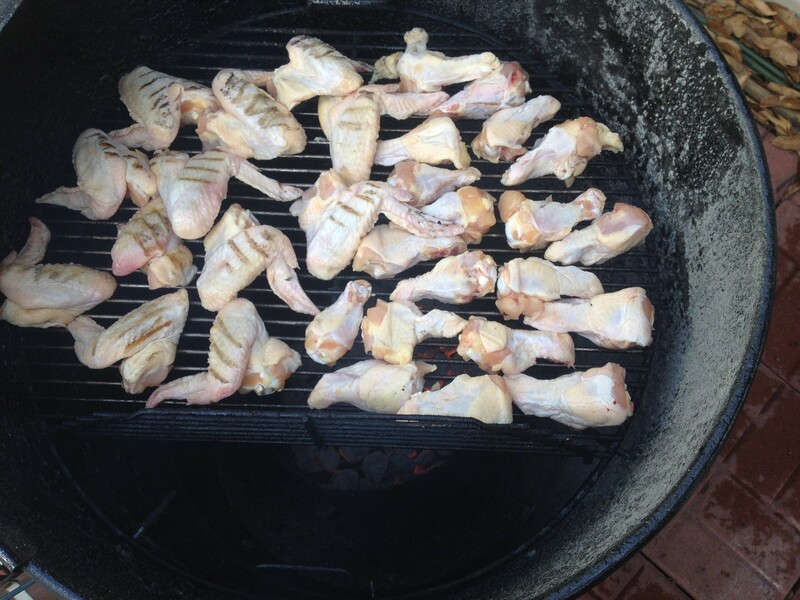 I got some badass color on these wings, with a single batch of charcoal and wood fuel. The UDS, quite well made if I say so, got up to about 200 degrees and didn’t need a lick of attention while I drank some beers and watched bad reruns on tv. Two sauces were made: Traditional hot wing sauce comprising a stick of butter and oodles of Frank’s Red Hot Sauce, and Honey BBQ sauce comprising a bunch of Sweet Baby Ray’s, a ton of honey, another stick of butter, and a couple dashes of Frank’s. I tried to roll the wings in butter and flour to fry them, but that failed, since I don’t own a cast iron skillet for frying. 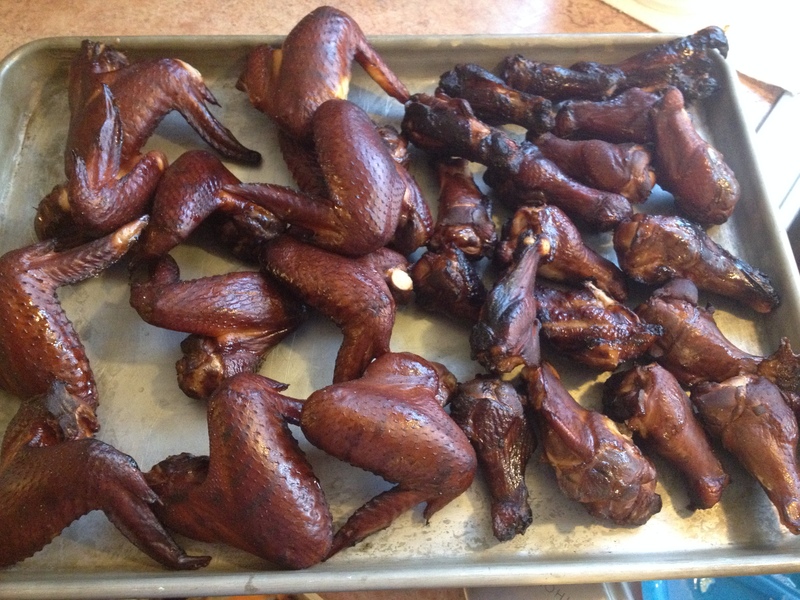 Instead, I dropped all the smoked wings into about 3/4″ of hot vegetable oil to fry the skin. 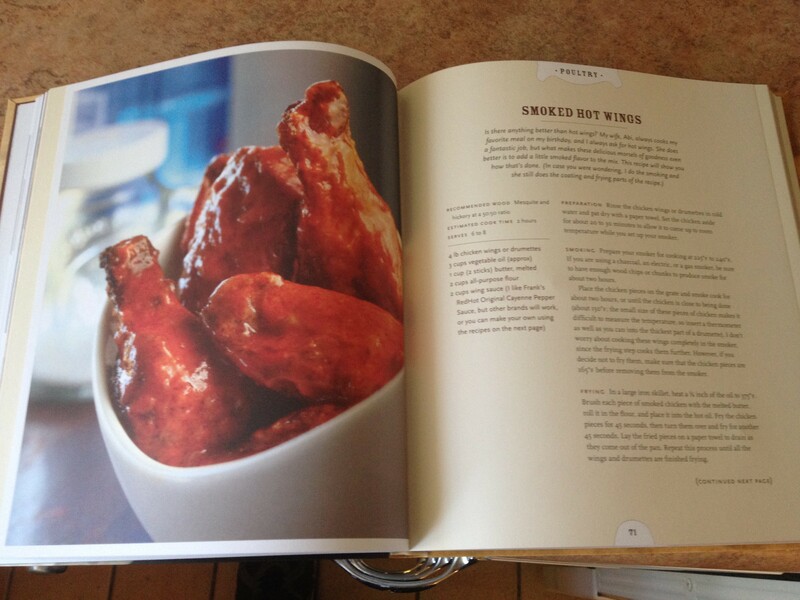 From the frying pan, each wing went into a warm foil pan of sauce. Drumettes into honey BBQ and the full wings into the Frank’s sauce. Super thrilling to me was seeing my son’s 7 year old friend crushing the honey BBQ wings. They were really good, with a deep smoky taste and a nice tenderness. Those hot wings grow on you, or so I was told. Truly, they were tasty wings with a nice finish and bite. In the end, the minimal effort resulted in two kinds of tasty wings full of deep smoke flavor, moisture, and tenderness. Each well-incorporated the richness of their respective sauces. Delicious poultry that everyone enjoyed. 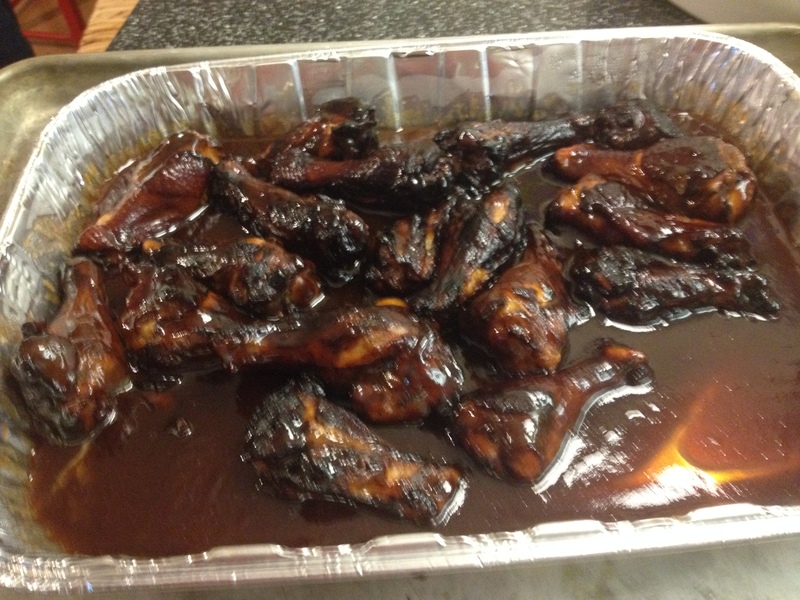 I received a text from someone with far more BBQ wing experience. 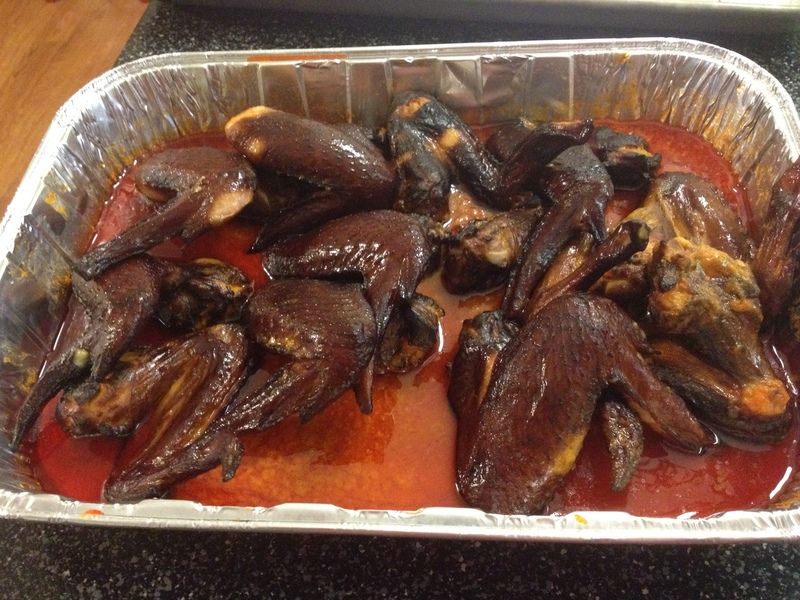 Smoked chicken wings don’t like to stick to sauce, unless you augment the sauce with some brown sugar. That explains why the honey BBQ sauce coated the wings well, and why the hot sauce slicked off their respective wings. In the future, add brown sugar for stickiness and perhaps some vinegar to keep the heat when doing hot smoked chicken wings.